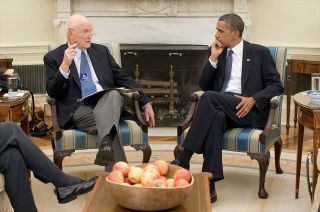 President Barack Obama meets with former Sen. John Glenn in the Oval Office at the White House in July 2010. Obama will present Glenn with the Presidential Medal of Freedom. Fifty years after becoming the first U.S. astronaut to orbit the Earth, John Glenn will be bestowed with the Presidential Medal of Freedom, the United States' highest civilian honor. Since 1963, the Presidential Medal of Freedom has been awarded to individuals for "meritorious contributions to the security or national interests of the United States, to world peace, or to cultural or other significant public or private endeavors," according to the White House. Glenn is a former Marine Corps Colonel, NASA astronaut, and Senator. In 1962, he was the third American in space and the first to circle the planet. Nearly four decades after his first mission and a quarter century after being elected to Congress, Glenn lifted off on board the space shuttle to become the oldest person to fly in space at the age of 77. Obama said that despite their different backgrounds, each of the honorees have "made a lasting contribution to the life of our nation." "They've challenged us, they've inspired us, and they've made the world a better place," the president said. "I look forward to recognizing them with this award." The news of the honor came just months after NASA and the nation celebrated the Feb. 20, 2012, 50th anniversary of Glenn's Mercury-Atlas 6 mission aboard his Friendship 7 spacecraft. Glenn took center stage again earlier this month, helping to induct his second ride to space — shuttle Discovery — into the Smithsonian on April 19. "NASA sends its warmest congratulations to Senator John Glenn," NASA's chief Charles Bolden said in a statement about the Presidential Medal of Freedom. "Both of John's historic missions to space personified America's dreams and what we believed we could be." "John Glenn helped this nation forge a path to a brighter future with greater capabilities," Bolden said. In addition to referencing Glenn's spaceflight experiences, the White House release that announced the award also highlighted the Senator's political achievements. He was an architect and sponsored the 1978 Nonproliferation Act and served as chairman of the Senate Government Affairs committee from 1987 until 1995. Glenn retired from Congress in 1999 after representing his home state of Ohio for 25 years. With this honor, Glenn joins the small group of astronauts who've been awarded the Presidential Medal of Freedom. The crew the first manned moon landing, Neil Armstrong, Buzz Aldrin and Michael Collins, were bestowed the honor soon after their return to Earth in 1969. A year later, the Apollo 13 crew, Jim Lovell, Fred Haise and Jack Swigert, as well as Apollo 14 lunar module pilot Ed Mitchell, were similarly honored. The Apollo 13 Mission Control team, led by Sig Sjoberg, Glynn Lunney, Milt Windler, Gerry Griffin and Gene Kranz, as well as former Johnson Space Center director George Abbey, were also among those recognized by President Richard Nixon with the Presidential Medal of Freedom. Among his many earlier awards, Glenn was presented with the Congressional Space Medal of Honor in 1978. NASA's highest award, it was given to Glenn by President Jimmy Carter. Last November, Glenn received the Congressional Gold Medal, which with the Presidential Medal of Freedom is considered the highest civilian honors. Together with the Apollo 11 crew, Glenn was among the first astronauts to be awarded the Gold Medal.